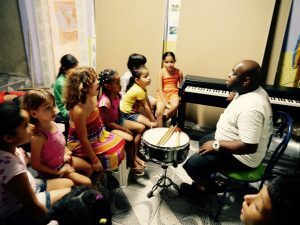 RIO DE JANEIRO, BRAZIL – In 2014, Tom Ashe, a Briton from Yorkshire, set about opening a music school in the Pereirão community in Rio, a small favela of about three thousand people, which lies between Laranjeiras and Santa Teresa. Now the Favela Brass project gives local children free music lessons and potentially the chance of a future in the music industry. 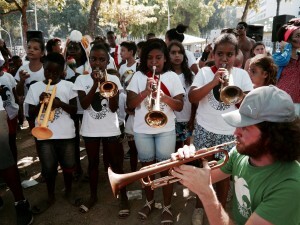 Tom Ashe and his pupils at Favela Brass performing at a party in Rio, photo courtesy of Favela Brass. So Ashe, a professional trumpet player, opened up a place for kids to learn himself. He arrived in Rio in 2008, lured by his love of the music. After playing at a roda de samba in Complexo de Alemão he had the idea of creating a more permanent project in a community. When he found a house big enough to hold classes and live in, he launched Favela Brass in Pereirão. Currently, 24 children attend the school. Rehearsals take place at his house and run from 4:30 PM to 7PM three times a week. The kids, who are aged between 5 and 15, are divided up into smaller groups and circulate between percussion practice, private lessons and theory. As well as having the chance to play trumpets, trombones and saxophones, the kids are also taught to read music. The project has a library of instruments which pupils use during the lesson and which they are able to take home to practice with. As brass instruments in Brazil cost two to three times as much as they do in the US or UK, most are donations, many of which have come from abroad. Children at the school are taught percussion and how to read music, as well as how to play brass instruments, photo courtesy of Favela Brass. Percussion is taught by “Mangueirinha”, one of the directors of the bateria (drum section) at Vila Isabel Samba School, volunteer musicians come from around the world to help teach, and weekly English lessons are on offer too. By teaching his pupils how to read music, giving them structure and teaching them in small groups, Ashe is providing them with an opportunity for a potential career in the music industry. “I want to create a culture of playing brass instruments here in this community. I don’t have plans to expand massively but I would like to grow the Brazilian tradition of wind music and add in other influences, such as the New Orleans jazz, and consolidate it here,” he says. The dream is for Favela Brass to play during the Olympic’s opening or closing ceremony in August. There are already plans to join a Japanese ska band, which will provide a link to the forthcoming Olympics in Tokyo, and in addition, both AirBnb and Google have visited the project. For now, the band plans to parade in Pereirão on Quarta-Feira de Cinzas of Carnival. Ashe will also be playing, along with two of his pupils, with his New Orleans Jazz band at the Lavradio Jazz Festival on the Monday of Carnival. More information, news and details about how to donate to the school can be found at the project’s Facebook page.